Asian Home Décor & Asian Gifts & Collectible in rich of Ancientmoods. 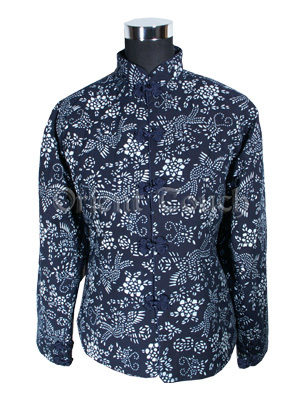 This warm mandarin jacket is made of Chinese traditional wax dyed blue cotton and features phoenix & floral patterns. Designed in wadded lining style, it will keep you warm and snug in the chilly winter days! Bust 32½" 33½" 34½" 35½" 36½" 38" 39½" 41½" 44"
Waist 24½" 25½" 26½" 27½" 28½" 29½" 31" 33" 35½"
Hip 35" 36" 37" 38" 39" 40" 41½" 43" 46"
Height 5'1" ~ 5'6" 5'6" ~ 5'10"
Conversion 1" ~ 2.54 cm or 1 cm ~ 0.394"